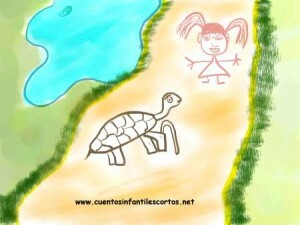 Hannah was a turtle who lived in “Imagination forest”. One day she had a dream that felt real, so she decided to make it real when she woke up. When her day began, she dressed up as a stone and went to the road that goes to “Calmed lake” and stayed there waiting. Only three people passed by that morning: “Daydream” the squirrel, “Lively” the butterfly and “Explorer” the deer. “Daydream” was lost in thought and didn’t even notice that Hannah was there. “Lively” jumped over the flowers and dodged Hannah, and “Explorer” just smelled her and then left. Hannah realised that it was just like in her dream, everybody had ignored her. Suddenly, a little girl with a pony tail arrived singing happily. When she saw the stone she stopped, caressed it and said: “Oh, this stone is so soft and beautiful, maybe it fell from a car. I will put it away so nobody can step on it”. Hannah felt satisfied for a moment, but then realised that the girl only cared about what happened to the stone and not about the rest. So Hannah took off her costume. The girl was really surprised to see that the stone was actually a turtle. “My beauty as a stone cannot eclipse my feelings as a turtle,” she said, – Try to look after everybody”. The girl understood what Hannah meant: “We are all important in Imagination forest and we have to reach Calmed Lake by helping each other and working together”.